I'd like to be able to hook up my new 17R4 laptop to multiple monitors (3 ideally). I am able to get one working with the HDMI port. 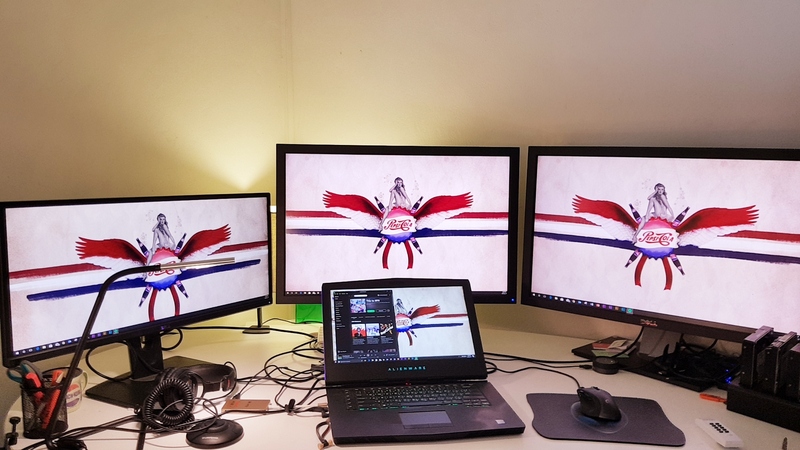 What are my best options for hooking two additional monitors? Hi there, you can hook up 2 (1 using mini DisplayPort and 1 using HDMI on the back of the system), however if you're looking for 3 like you mentioned, you can look at newer monitors that allow daisy chaining and run 2 off of an active DP cable, so from the computer from mini DP port to the monitor, and then another cable from that monitor to the next monitor, and then the last monitor can just be run off of the HDMI port. If the monitors you're looking at do not allow this, or if the mini DP daisy chain doesn't work easily, another option is looking at a Thunderbolt/USB 3.1 dock that allows external displays or even an Alienware Graphics Amplifier (here is one at this link), that allows for Desktop GPU's to be used. I use the TB3 (TB3 to displayport cable), plus the hdmi and also the mDP - all at the back. Got 2 monitors running 4k and the other at 1080p. Plus the laptop screen too. If you have Thunderbolt, that’s best since it offers 2x DP 1.2 outputs, which is by far the most bandwidth. Thunderbolt means you can get a Thunderbolt dock, or you can save cash and get a Thunderbolt to Dual DisplayPort adapter. Or you can save even more cash and get a USB-C to single DisplayPort/HDMI adapter for that port, then use the other DisplayPort and HDMI outputs for other displays. Finally, you could buy a DisplayPort MST hub, which is handy if you don’t have displays that support daisy-chaining and/or not all of your displays support DisplayPort. However, an MST hub can only handle display configurations where the total bandwidth requirement of all displays attached to the hub is within a single DisplayPort 1.2 output’s capacity, which means 1x 4K, 2x 1600p, or 4x 1200p — assuming your GPU allows four displays. That’s why I initially suggested the Thunderbolt to Dual DisplayPort adapter, since that gives you more bandwidth, and you could actually even attach a DisplayPort MST hub to one of the outputs on THAT adapter if you really needed to. Finally, if you need to use DisplayPort to HDMI/DVI dongles with either an MST hub or a Thunderbolt to Dual DisplayPort adapter, you might need to use the less common and slightly more expensive active adapters rather than passive adapters, since those Thunderbolt adapters and MST adapters don’t always support Dual Mode DisplayPort, which is required in order to use passive HDMI/DVI adapters.